Purchase a copy today for yourself and/or the leader(s) in your life. Email me directly if you are planning on purchasing a set for your team and/or classroom. 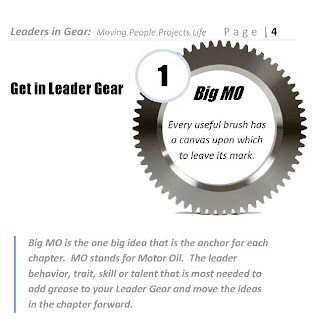 "Leaders in Gear is full of lots of practical ideas for working leaders." I intentionally wrote Leaders in Gear as a resource for busy professionals and student leaders. • The information is tangible and applicable today. • The material is bundled into three separate application areas: personal development, interpersonal skills and presentation improvement. • Each chapter is brief and concise. The longest chapter is only five pages. Get it quick and get back to work. Click Buy Now to order your copy today. If you are a team leader or educator and would like to order multiple copies, email me (rhett (at) yournextpeaker.com) to learn about our bulk discounts. Thank you. The Second Edition of Leaders in Gear is here. Click on the Buy Now link to the right to purchase your copy today. Enjoy. Click here to download a 30-page excerpt of the book in PDF format. 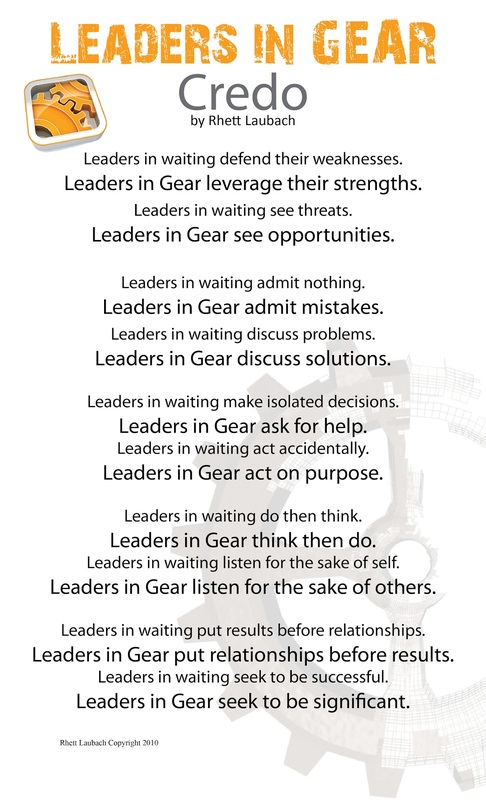 Click here to download a legal-sized PDF of the new Leaders in Gear Credo poster to display in your office or classroom. We are currently sold out of the First Edition of Leaders in Gear. Please check back here (or subscribe to this blog's feed using the links to the right) for updates on when the Second Edition will be available. If you are interested in making a purchase soon, email us directly at owner (at) yournextspeaker.com and I can make arrangements for a short-run print job for you. Thank you! 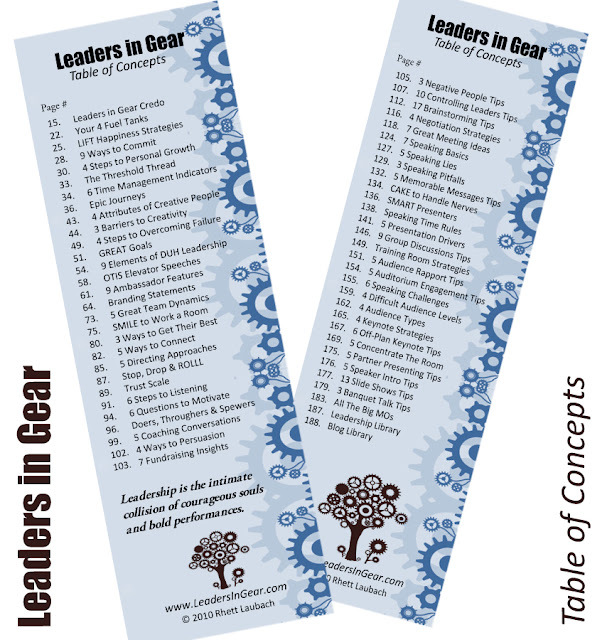 Leaders in Gear is the perfect gift idea for any leader in your life. Click here for a preview PDF and here for an excerpt PDF. "I read your book Leaders in Gear. Every time I'm having trouble with something whether its making a decision or planning something I take a look at it and it always helps me out." "Inspire good work from yourself, your team and your presentations." Leaders in Gear will inspire you to take action and get your leadership in gear in three areas of your life: your personal leadership journey, your interaction with your team and any speeches, workshops or presentations you give. "Good work" refers to not only striving for excellence in everything you do, but also working to be an ethical leader of strong character. You will discover that Leaders in Gear is full of stories, quick tips and very specific strategies to move you closer to those ends. 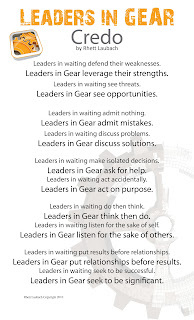 Leaders in Gear Credo Poster Updated Available! "I just wanted to say that I finally got time to look into your Leaders in Gear book. It is great! I'm only about 50 pages into it, but I've been able to connect with it really well, so I intend to tell my school administrators, my parents and my FCCLA adviser about it. Hopefully, they're as interested as I am. There are some pretty quotable comments you've got in there, so I might end up using them as status updates every once in a while, hope you don't mind! 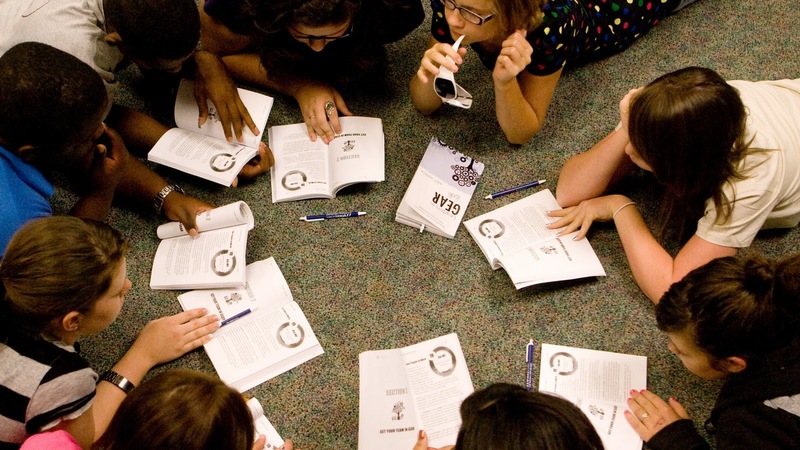 "Leaders in Gear is one of the best resources I have for helping students be the best leader they can be and preparing them to create workshops and speeches that engage their audience as they deliver their message." Four Big Questions to get in G.E.A.R. One of the primary purposes of leadership conferences and classes is to inspire people to get their leadership in gear. This initiative is obviously close to my heart and one that makes a dramatic impact. As we motivate and inspire conference participants or leadership students to make a difference, there are four key questions we need to help them with. Their answers to these questions and our sage advice on how to answer them provides the foundation and fuel needed to get their leadership in gear. Four Questions to get in G.E.A.R. Grounded - Why are you here? This question is not about why they are at the conference or in the class (although that is important). It is about why they are anywhere. What is your purpose in life? Leaders who understand, are deeply connected with and stay grounded to their core purpose are more likely to get and stay in gear. This purpose must align with your deepest values and beliefs. Why are you here? The answer to this question gives life meaning. Engaged - What do you create? Highly effective leaders are results-oriented. They are greatly concerned with making things happen, creating change and leaving everywhere they go and everyone they connect with a little better than they found them. They are excellent at creating cool, interesting and meaningful stuff; which in turn attracts people with those same qualities. What do you create? The answer to this question gives life direction. Authentic - Who are you? Self-awareness is critical to good leadership. You must understand your strengths, weaknesses, talents and skills before you can fully lead. Highly effective leaders are so true to who they are, their "leaderly" actions become second nature. This allows them to genuinely place their time and attention on others. People are starving for leaders who are authentic, bold and caring. Who are you? The answer to this question gives life clarity. Relationship-focused - Who is on your team? Life and leadership are team sports. Engaged leaders have identified, understand the importance of and spend time cultivating the relationships in their life. This includes people following them and people they follow. They put relationships first and results second. Who is on your team? Answering this question gives life joy. If you are a leadership teacher, trainer or conference organizer, invest time examining your curriculum, material and speakers and make sure these four critical questions are addressed. To bring glory to God through my relationships and my leadership teachings. 2. What do you create? Personally, I create harmony and security for my wife and daughters. Professionally, I create a tribe of inspired and motivated students, educators and professionals armed with better tools for getting their leadership in gear. I am a Christian, American, husband, father, speaker, author, blogger, singer-songwriter and epic fajita artist. I am more than what I do though. I am what I believe, who I spend my time with, what I read/watch/listen to and what I think. I work hard to align all of those elements with my answers to #1 and #2. My most important team mates are Jesus Christ, my wife Ashley, and my daughters Vivian and Addison (and soon-to-be Emerlyn Kate :). Ashley and I's immediate family, friends, peers, church family and long-time clients also play a vital role on my team. All my audience members, clients, and suppliers comprise the rest of my team. They are all a joy to work with and make my team exciting, colorful and ever expanding. - Posted from Rhett's iPhone on tour in San Diego. 2. Consume the right media. 3. Attend the right conferences. When you attend conferences, to make the most of them, follow these five guidelines. 1. Be child-like. This doesn't mean throw a tantrum if the room is too cold. It means ask questions. Lots of them. Don't let your pride or reputation or position keep you from raising that hand and getting clarity, more information or better information. 2. Take organized notes. If you aren't writing, you aren't learning. But don't just write to recall. Write with organization. Make notes of what needs to be delegated, acted upon immediately, filed for later, etc. This will help your post-conference actions take flight quicker and more efficiently. 3. Offer solutions, advice and suggestions in a CVS format. Concrete. Visual. Simple. It is important to not only add value where you can, but to be clear with your thoughts. 4. Maximize gap time. The official sessions and breakouts will be valuable learning environments, but the real magical sharing times happen early in the morning, at meals and during breaks. Make the most of them. 5. Seek out answers. If possible, go to conference with specific questions and challenges you are looking to resolve. Then hunt to find experts, speakers, exhibitors and attendees who might just have the answers you are looking for. Sold out of Leaders in Gear last night after my keynote at the 2010 Indiana FFA State Convention. I am so very proud of all the students, parents and advisors for investing in their leadership. LiG is packed with tips and strategies to help them know how to use their influence to make a positive difference in the lives of others! Great big thanks to the state advisors of the Oklahoma CTSOs (BPA, DECA, FCCLA, FFA, HOSA, SkillsUSA, and TSA) for investing in your state officers by purchasing a Leaders in Gear and Activator (www.PersonalLeadershipInsight.org) for each of them. With your officers equipped with each of these, they are ready to start building every keynote, workshop and training for the entire year! Best of luck! Micheal Brammer, Pennsylvania FFA Executive Secretary - He purchased 11 books - one for each of his state FFA officers as a resource for speech material and for their personal leadership study. Linda Miner, Laverne High School student council advisor and teacher - She purchased 32 books - one for each of the graduating seniors at LHS as graduation gifts. Claude Kershner IV, Oklahoma State University MBA student - Claude purchased the book to supplement his masters studies as he recognizes the value of improving his LQ (leadership intelligence). Linnie Berkenbile, Oklahoma Business/Marketing/IT ED Division State Program Manager - She purchased 80 books - one for each of her teachers to use as a leadership teaching tool in the classroom. How can you use Leaders in Gear to help your team get their leadership and presentation skills in gear? If you have a Facebook, you can also keep up with everything Leaders in Gear related by joining our fan page. Just search for Leaders in Gear the next time you log in to Facebook. If you are one of our awesome LIG purchasers, please post a note on the wall and tell our over 300 fans what you most like about your Leaders in Gear book. Also, if you are on Twitter, please post a tweet with your favorite LIG chapter or lesson. Tag it #ligbook. Thanks! "Leaders in Gear is an excellent resource for anyone looking to better their leadership skills and speaking abilities. Rhett breaks his points down in an easy to understand fashion and offers practical hands on examples that will help leaders succeed. This is an awesome resource for folks of all ages!" Download a 30-page excerpt of the book in PDF format.